Fairmount Park is open year-round for off track wagering and has live racing from May through September. 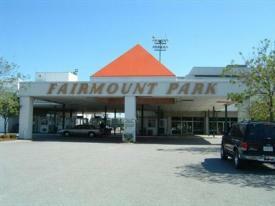 Fairmount Park Racetrack is located in Collinsville, Illinois, part of the St. Louis metropolitan area. The track hosts Thoroughbred flat racing. It is one of five horse racing venues currently active in Illinois, and the only one outside the Chicago metro area. The track also featured Standardbred Harness racing, but discontinued it in 1999. The track opened in 1925. The racing surface is a one-mile (1.6 km) dirt oval, with straight chutes for six furlongs and 1¼ mile races. Ogden Corporation bought the track in 1969. In 2000, Ogden sold the track to Bill Stiritz, then the chairman of Ralston Purina. Fairmount Park offers simulcast wagering from tracks throughout the country.